Marlboro Cricket Club SA5 put on a great team performance on saturday to notch up yet another victory.With Zain Asmal and Ahmed Fulat unavailable, the team was bolstered by Zameer Loonat and a debut in the first team for up and coming youngster, and great talent, Naeem Nathie. Batting first on demon wicket and a rather thickish outfield, MCC notched up 131/9. 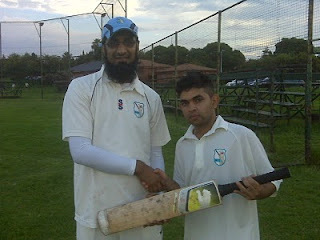 Moosa Patel top scoring with 39. Randburg always had a difficult chase on their hands. And our bowlers delivered.Openers Safwaan and Nathie started brilliantly,and Moosa and Zameer took over and wrapped up the middle order. After a mini comeback by Randburg, Ebrahim Kadwa wrapped up the tail. Randburg 101 all out. congrats boyz, awesome team effort! let's hope it takes off here..league win in sights inshallah!